"Honesty is like an icicle; if once it melts, that is the end of it." The strange weather this year really confused my burning bush shrub. Now it's growing mysterious icicles. What a beautiful photo, caption, and proverb. Thanks for hosting and have a great week. What a great proverb! This crazy weather really has the plants confused, doesn't it? Love that proverb! How very true! Nature in all its glory! Thanks for hosting and Happy WW! A frozen melt of oozing flame retarded weather. Beautiful icicle. I wish we'd get some snow. Great photo to go with the quote. Cool photo (no pun intended)! Beautiful picture. I have a similar one except it is frost. What a cool formation! We're getting snow right now and I sure hope the ice stays away! Last week's ice storm, I was not so fortunate to get any good shots. I kept to the safety inside my four walls. I did snap a few images with my iPhone, but that didn't do the scenery justice. 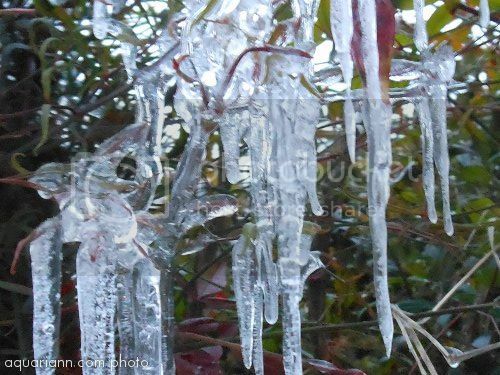 I just love how you got the icicles shots on the bush - really cool stuff! Thanks for hosting this week's WW & allowing me to link up! Super beautiful..your images are always visually striking..gorgeous! Thanks for hosting..and happy WW! What a beautiful photo! Ice at its most artistic. Thanks for hosting. Awesome photo! And I love the quote! Nature sure is finicky. But your bush is beautiful with the ice hanging from it. Indeed! The weather is completely wacky right now. It is 51 degrees right now, but I have a feeling we'll see icicles before the end of the weekend. Great photo! Hope you're having a wonderful WW! Cool photo,I like how icicles look. Great photo! I love it when there are good winter photos of plants. The caption really made the picture. Love the irony. Happy Wordless Wednesday! My entry is here and here.